This place offers a serious NY slice o' pie (that's pepperoni, not blueberry), and what is this "Manhattan Special"? 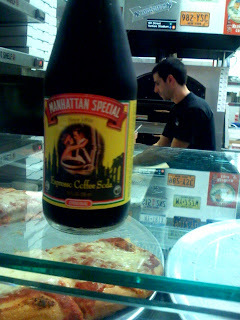 An amazing coffee soda, imported from NY and reputedly impossible to find in CA. Except here. verdict: Real good, real authentic. The boys at the oven are from Brooklyn. Tributes to heroes of 9/11 on the wall. Feels like the real thing.